Brilliant Studio Ghibli animation has inspired many people in a lot of different ways. Their touching stories and incredibly detailed animation style have touched us all. 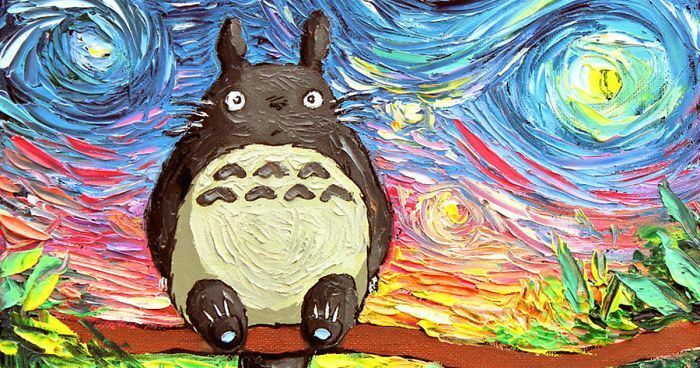 Bored Panda has collected some of the best Miyazaki fans' paintings to show what creative admirers are capable of. From vibrant watercolours to a 'Starry Night' version of Totoro, these paintings will hopefully fill the void 'till Hayao Miyazaki finishes his newest animation. And if you are an artist yourself, we hope that these pieces will inspire you to create something awesome and add it to this list! This isn't In the Air, it's Howl's Moving Castle. I wish that was a thing! Just wow! Deifinitely in the top 5! Watch out, heeeere we come! The Ghibli museum is so wonderful! So whimsical! It's unfortunate that photography is not allowed inside, but it's really something to be experienced in person. As a second thought: beautiful yet incredibly sad.